Just wrap the tape around the ball and read the diameter directly, there’s no math involved! 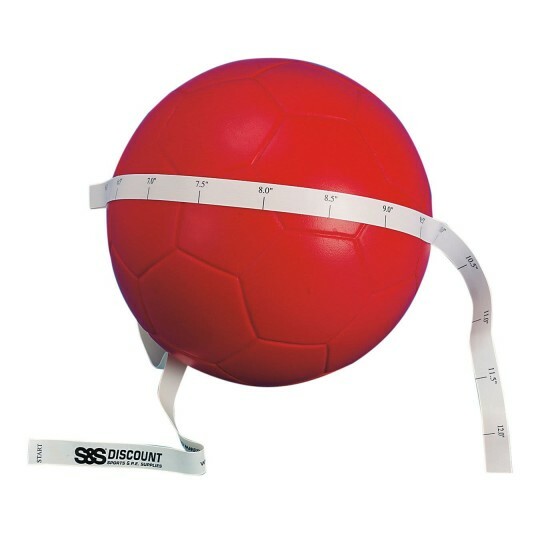 Durable non-stretch vinyl tape measures 39” x 5/8"
A fast and easy tool to ensure your sports ball is properly inflated! Instantly check the diameter with this unique measuring tape to maximize performance and extend the life of your sports balls. Just wrap the tape around the ball and read the diameter directly, there’s no math involved! Gauge measures ball diameters from 6" to 12" in 1/2" increments. Durable non-stretch vinyl tape measures 39” x 5/8" and has graphics and instructions printed on one side. Spectrum™ Poly Spot Marker 9"